I wrote earlier this week that Sky’s “Team Principal” was considering relaxing his standards when it comes to hiring a new DS for the squad. I wondered who he was talking about and then lo, a story popped up on cyclingnews.com: Neil Stephens is looking for a job and he’s in talks with Astana and Sky. The CN article completely brushed over Stephens’ past but the mere mention of him was ringing alarm bells with me. And I’m not alone in my concern, The Guardian’s Richard Moore has written about the matter. So here’s some more on Neil Stephens. Neil “Stevo” Stephens was an Aussie super-domestique, who after a few small squads, spent most of his time with ONCE in the 1990s, before finally switching to Festina with whom he landed his biggest win, a stage of the Tour de France. His mullet was a feature in stage races, the blond hair blowing in the wind as he pulled on the front of the bunch. Sadly ONCE and Festina rhyme with organised doping but amazingly Stevo was never sanctioned for the Festina affair, with child-like innocence he said he thought the injections administered to him were mere vitamins. LOL, as they say. After some time away he returned briefly as a DS with the chaotic Linda McCartney team but the team collapsed and he spent time as a tour guide with organised rides and training camps in Spain. For 2006 he got behind the wheel of a team car with former boss Manolo Saiz at the Liberty Seguros team. Only the team folded and soon after he popped up as a DS with Caisse d’Epargne, just in time to be part of the team’s pathetic defence of Alejandro Valverde. The sponsor duly decided not to renew its contract with the team. And that’s where we are today. At first glance you’d think Team Sky just need to avoid the man because of the jinx factor. Almost every team he’s been in gets busted, collapses or sees the sponsor fleeing. But ask yourself, is it random bad luck? For me, no. Spain has had terrible doping problems and time after time Stephens pops up in the middle of things. Did he pick up the phone to WADA when Manolo Saiz was hiring Fuentes? Did he admit he was disgusted with Valverde’s pathetic defence against a positive DNA match? No. He was cashing his pay cheque. Let’s not be too mean. Doping is an institutional problem, an “underlying culture”. Stephens is based in Spain and being generous, you could say he’s just been in the wrong place. Maybe it’s time for a second chance? I’d say yes, but just not with Team Sky. If you have a terrible reputation, then regain it with a youth team or a smaller pro team, prove you stand for healthy cycling and something positive. Maybe some readers will ask questions like “but what about Bruyneel or Gianetti?” or “are you happy with ex-Festina rider Didier Rous behind the wheel at Bbox?” but this is different. First Rous admitted his wrongdoing and is quietly making amends, someone like Gianetti is using their modest team to slowly turn around a poor reputation and Bruyneel’s unhealthy image is his own team’s concern. We might as well sign Bruyneel? For me, you just can’t walk into a big team with a strong reputation and expect the team’s image not to take a battering. Team Sky is outspoken on doping, this is all about reputational risk. Just as they say you can judge a man by the company he keeps, any sports team that hires someone associated with a shady past says plenty about the team’s image. It invites criticism and gives ammunition to those who want to suggest Team Sky will lower their ethical standards. Let’s also remember Sky have made it known in the media that they have rejected some riders because of questions over their bio-passport data. If suspicions over a rider warrant the barge pole treatment, even greater scepticism should apply when it comes to hiring management. One of the attractions of this team was the refreshing anti-doping stance. Only a handful of teams are willing to shout about a clean sport, most just mumble platitudes. Sky has been one of the clearest voices here but this reputation can be muddied very quickly with the wrong recruitment decisions. Say it ain’t so Dave. Well said. Makes me wonder if Brailsford has his head screwed on. They worked to build a good image, its being undermind by stories like this and they have not even signed him, its like the talk is enough to do damage. Well said. The message should get through because the subject is being mentioned by others. A shame it overshadows Russ Downing's win in Belgium. Just come across this post,via the link in today's post. 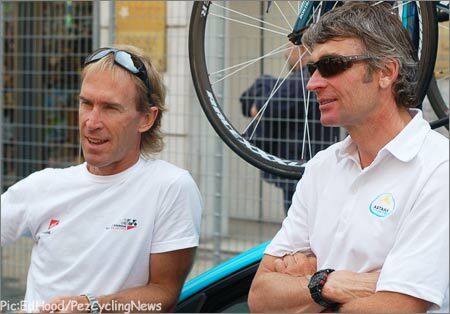 I'm an Australian cyclist & cycling fan in Oz,& am constantly bewildered by the high profile positions & amazingly good press Neil Stephens snags for himself.Festina? Right in the thick of it.Liberty Seguros? 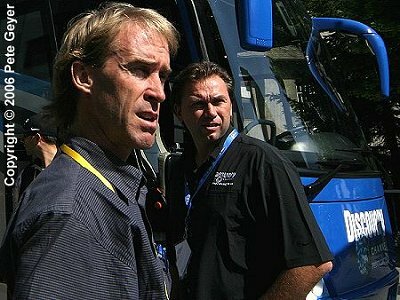 Who was it most often seen assisting Heras during his infamous 2005 Vuelta? Not so long ago he was coaching or assisting one of our amateur or national teams (I forget which exactly),& the press were incredibly kind to him-particularly the supposed "high class" Ride Cycling Review mag.It even made a point of mentioning the fact that nothing solid had ever been pinned on Stephens,& insisted he's just been incredibly unlucky with the timing if his involvement in dodgy teams.WTF? He's been in it up to his neck,& has miraculously avoided being proved of anything.He should have been drummed out of the sport many,many years ago.And the publications that have aided & abetted him in Australia are guilty as well. Kudos Inner Ring-I love your work. "Please forgive the lateness of my reply". Thanks for dropping by. My take is that doping has been an intrinsic part of the sport, trying to find a guy unlinked to suspicion is very hard. Stevo might bring a lot of experience when it comes to admin, tactics, networking and more. But all the same I was moved to right something as Sky especially seemed to have this higher ethical standard and Stevo's past just clashed a bit with this. As another Auusie, spot on. The so called authorities here pillory young bike riders outrageously and then have to apologise but NS seems to be a favourite despite his unsavoury cconnections in the past. Not exactly consistent.